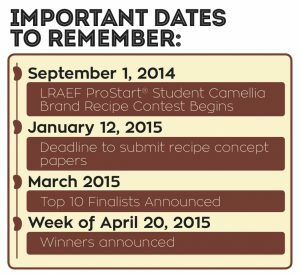 The Louisiana Restaurant Association Education Foundation (LRAEF), in a new partnership with Camellia Brand, announced recently a ProStart® Program recipe contest for the 2014-2015 academic school year. The recipe contest will challenge high school students in each of the participating 52 ProStart Programs statewide to create an original recipe featuring one or more Camellia Brand products: Red Beans, Lady Cream Peas, Black Beans and Crowder Peas. Details were presented to ProStart students at the beginning of school year and each team will develop recipes throughout the fall semester before submitting them to be reviewed by LRAEF and Camellia Brand selected judges. Ten finalist teams will be invited to prepare their recipe in person for a LRAEF and Camellia Brand tasting panel of judges. First and second place recipes will be selected by judges based on taste, presentation, creativity, and originality. The winner will receive a $5,000 cash award and the runner-up will receive a $1,000 cash award payable to the school to be used for support of the ProStart Program. The winning recipe will be featured in promotional materials and on the Camellia Brand website. The winning students will be celebrated at a luncheon and offered paid cooking demonstration and brand ambassador opportunities at Camellia Brand-involved trade shows, events and festivals. Students will also have the opportunity to participate in live stream video opportunities and Camellia Brand’s new product line developments. ProStart is a two-year, culinary management program for high school juniors and seniors with a curriculum designed to teach students culinary techniques as well as restaurant management skills. By brining industry and the classroom together, ProStart provides students a platform to discover new interests and talents, and opens doors for fulfilling careers. ProStart is in 50 high schools statewide and more than 1,500 students participate in the program. ProStart is a registered trademark of the National Restaurant Association Educational Foundation. As the philanthropic foundation of the Louisiana Restaurant Association, the LRAEF exists to enhance our community through expanded educational career opportunities, the formation of strategic partnerships and the elevation of our professional standards and practices.